I have recently written a blog post about the use of the word ‘alarmism’ in the context of current climate change debates, where the word is used to describe those who write and talk about an impending climate catastrophe. Today I want to write about another type of discourse that is alarming but has not yet generally been labelled alarmist, as far as I know. I will also try to show how, when and perhaps why these two discourses began to be linked and what the advantages and disadvantages are of framing warnings in terms of catastrophe or apocalypse. In recent years the issue of antibiotic resistance, the rise of healthcare associated infections like MRSA, and the emergence of new bacterial infections like carbapenem-resistant Enterobacteriaceae (CRE), have seldom been out of the news. The seriousness of these threats were highlighted again when the UK’s Chief Medical Officer, Dame Sally Davies addressed the Commons Science and Technology Select Committee in January and published a report on the topic in March this year. She warned that we might be close to running out of effective antibiotics in the near future, a situation that would mean that even a small cut might become life-threatening if a bacterial infection occurred. She talked about an apocalyptic scenario. This was not the first time that the apocalypse was invoked in the context of warnings about the rise in antibiotic resistance. Antibiotic resistance emerged almost simultaneously with the use of antibiotics, such as penicillin, after the Second World War, but only became a real problem during the 1990s. In 1998 Richard Smith, then editor of the British Medical Journal warned that “[i]ncreasing resistance to antimicrobial agents is health care’s version of global warming.” Scientists also began to make reference to a possible ‘antibiotic apocalypse’ in The Lancet for example (and there are many more). In the spring of 2005 Richard James, Professor of Microbiology at the University of Nottingham (now emeritus), entered the apocalyptic battle ground with an article for the University of Nottingham’s Vision magazine entitled “Battling bacteria”, in which he talked for the first time of a ‘post-antibiotic apocalypse’. Comparisons between antibiotic resistance and global warming seem justified, but they are also problematic, especially when both are framed apocalyptically. Both climate change and antibiotic resistance are ‘human-induced’, as they are linked to an overuse of limited resources. Both are global, societal and also ecological problems. Both have provoked calls for the reduction of ‘footprints’, be they carbon or ‘resistance footprints’. And with regards to both we need to accept responsibility and take action. The problem is can action be motivated by warnings framed in terms of catastrophe or apocalypse? Talk about the possibly catastrophic effects of climate change have been called alarmist. What about warnings about the possible impacts of antibiotic resistance? Are they alarmist or justifiably alarming? With relation to climate change, scientists have warned that provoking fear might lead to public fatigue and cynicism. What about raising fears about an antibiotic apocalypse? When highlighting the diminishing powers of antibiotics, the metaphor of the apocalypse has advantages and disadvantages (and might also have diminishing powers!). (1) It raises the profile of the problem and gets it on the public agenda, at least for a while. However, if nothing is done and the apocalyptic warnings have to be repeated over and over again, they might loose their power as calls for action. (2) The image of an apocalypse, especially in a religious sense, usually evokes an end of the world scenario where human action seems futile and humans are helpless. However, there is also a more secular tradition of the apocalypse, as popularised in various post-apocalypse films or video games, such as Gears of war, I am Legend, After Earth, Oblivion so on. Here the stress is on creative thinking and ingenuity employed to save humanity. Both in the case of global warming and in the case of antibiotic resistance, the metaphor of the apocalypse could therefore still be useful and, if used with more ingenuity, might deflect accusations of alarmism. However, even post-apocalypse films tend now to be regarded as passé and have lost some of their audience pulling power (according to a one-person focus group I consulted!). So what can scientists do when communicating about antibiotic resistance? Questions remain however: Are apocalyptic metaphors, analogies and comparisons loosing their rhetorical force, much like the antibiotics they warn about? Do they provoke resistance to the message they want to convey? 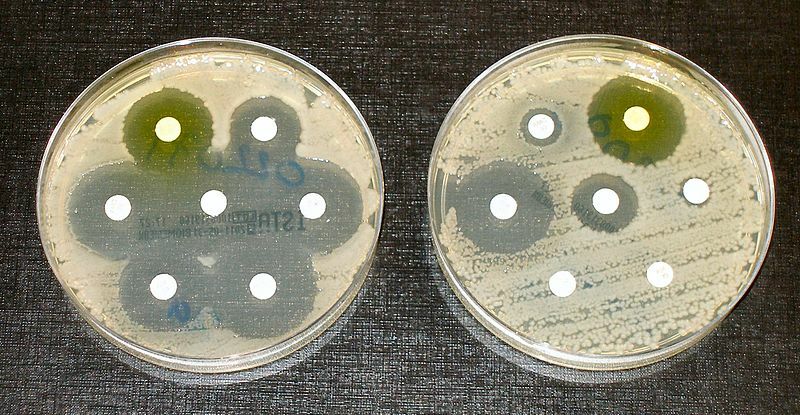 Image: Wikimedia commons: Antibiotic resistance tests: The bacteria in the culture on the left are sensitive to the antibiotics contained in the white, paper discs. The bacteria in the culture on the right are resistant to most of the antibiotics.